Amazon Glacier is secure, reliable and extremely low cost storage service for data backup. Everything you need to know to help you get started using them for backups. Amazon announced its new product Amazon Glacier – Secure, reliable and extremely low cost storage service for data archiving and backup. Unlike Amazon S3 and RRS, Glacier’s are designed for data that is infrequently accessed and so the cost of data storage is as little as $0.01 per GB per month. Like all Amazon Web Services products, Glacier is also pay only for what you use with no up-front expenses or long-term commitments. How to Use Amazon Glacier? Amazon Glacier has just hit the market and so third party AWS applications don’t have support for Glacier’s as of now but many applications will be adding Glacier support in this week itself and so as of now we are only left with using the AWS console to upload the content to Amazon Glacier. Signing up for Glacier is really simple like any other AWS product and all you have to do is just click the signup button and rest is all done using your account details. Once signed up you can create Vaults (Similar to Buckets in S3 or kind of folders). The following image explains the complete process of using Glacier. 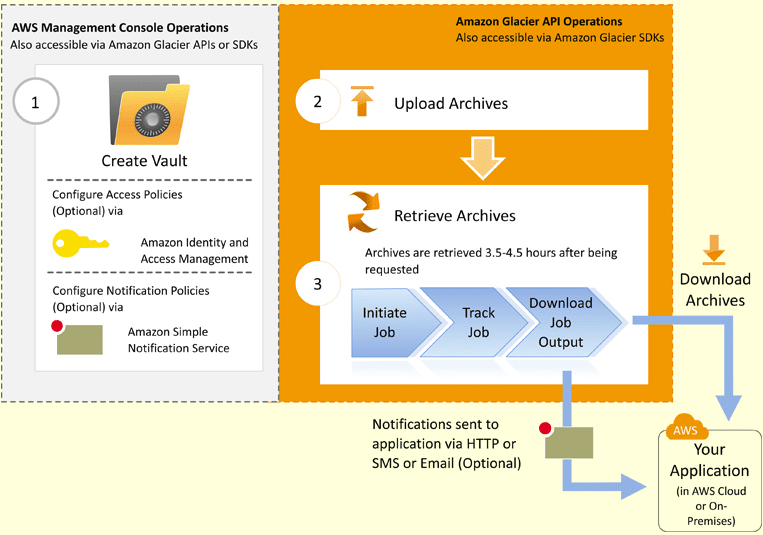 The left hand side gray portion in the above image are the operations that can be perform at the console and rest has to be done via the API and so until we have support for those operations in the third party application, we cannot upload anything to Amazon Glacier. Fingers crossed. 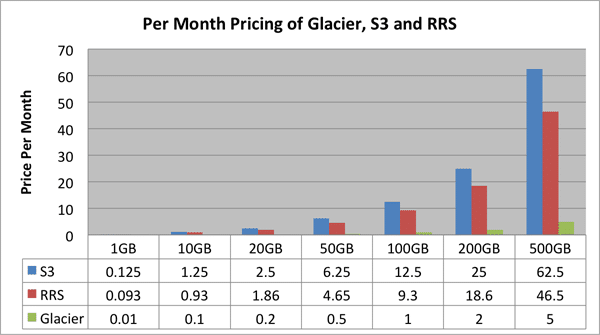 Storing 100GB of data on RRS will cost roughly $10 per month where as the same data stored on Glacier will cost $1 per month only. This is something we all need to understand before getting things moved to Glacier. You can only retrieve up to 5% of your average monthly storage (pro-rated daily) for free each month. If you choose to retrieve more than this amount of data in a month, you are charged a retrieval fee starting at $0.01 per GB. If you are deleting any data within 90 days of storage, you will be charged $0.03 per GB. After 90 days, it is free deletion. Amazon Glacier’s are cheapest online backup service ever but it has some additional charges that we also need to understand. Share your views in comments below. A nice article about the awesome new product from amazon. BTW, may I know what plugin you are using for the social sharing bar to the left of your posts? Its awesome. Hi Deepak, glad to see you liked the article and I am using Digg Digg Plugin for social sharing.